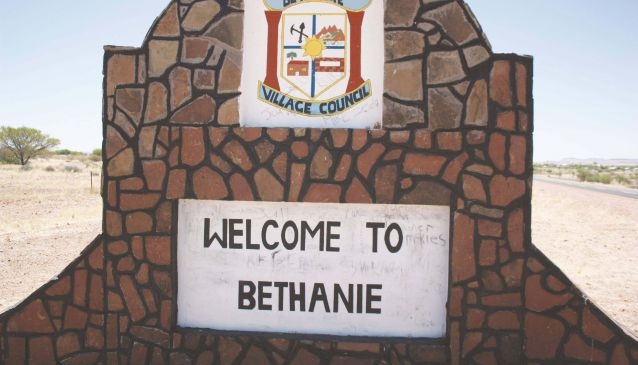 Bethanie is one of the oldest settlements in the country. It is located west of Keetmanshoop and it isn’t necessarily the most talked about destinations in Namibia. The town is easily accessible from the main road between the coastal town of Luderitz and Swakopmund. The town is steeped in history and it is set in a dry and barren rocky area. Bethanie was founded by the London Missionary Society but due to lack of manpower, they sent a German to the area instead. The town is not located on the regular route but it is worth a visit for those who are interested in history. The original church was constructed in 1859 and still exists to this day. Another building that has stood the test of time is Reverend Heinrich Schmelen’s Schmelenhause which was constructed in 1814 which is the oldest building in Namibia and is a National Monument and also houses a small museum. Schmelen left Bethanie in 1822 because the Orlam were unhappy with the missionary work being done among the Kai||khaun also referred to as ‘The Red Nation’. They did not entertain the idea of going to church and vehemently refused to attend. The first deed of sale was signed between the Nama people and a German representative; Adolf Luderitz, in 1883. 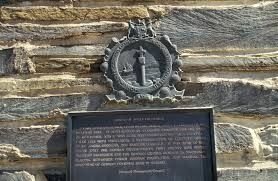 The deed was for an area of land on the coast which is now known as Luderitz. Accommodation options in the area include Bahnhof Hotel; Eagles Nest Lodge and Desert Horse Inn. The Bahnhof Hotel is located in the village of Aus, about 120km from Luderitz. The main building houses a restaurant and the Historic Bar with satellite TV. There is also a nice cozy fireplace where guests can relax during the colder days and nights. The sundeck offers the perfect opportunity to watch a lovely Namibian sunset. There is also laundry service; internet access; disabled access and secure parking with a night security guard. All meals at the hotel are served from an a la carte menu and guests can enjoy their meals in either the indoor or outdoor seating area. Meals are served buffet style for larger groups. Freshly baked bread and cakes have become a trademark of the hotel. The hotel also boasts a beer garden which is pretty self explanatory. Accommodation at Bahnhof is in double rooms or the family room. There are 20 double rooms, one of which is wheelchair-friendly, all the double rooms have en-suite bathrooms; twin or double beds; a fan; tea/coffee station and plug-in mosquito repellent. The family room can accommodate two adults and two children and has similar features as the double rooms. Eagles Nest Lodge is located at the foot of the Aus Mountains in the Klein Aus Vista Nature Reserve on a ten hectare farm which borders Sperrgebiet. The Nest is about 7km from the main reception and restaurant complex of the Desert Horse Inn. The main area also has a telephone; fax machine and internet access. Accommodation at Eagles Nest is in nine rock chalets. The more popular chalets being the Boulder; Desert Vista and Rock chalets. Some chalets are built partially from large granite boulders and others are built into the actual rock. Each chalet has en-suite facilities which include a flush toilet, wash basin/shower with soap dispensers; a fully equipped kitchenette; a lounge; a fireplace; a private verandah which overlooks the famous Namib Desert. The chalets also have wooden furniture; a bedside table and light as well as an honesty bar. 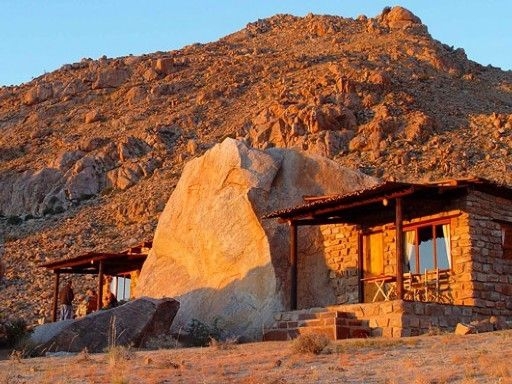 The Desert Horse Inn is also located on the Klein Aus Vista Nature Reserve and is the perfect stop-over for visitors heading to Keetmanshoop; Fish River Canyon and Luderitz. The Namib Desert wild horses can be seen in the vicinity of the inn. The main area of the inn is built entirely of wood and houses the reception area and curio shop on the lower level. A telephone; fax machine and internet access can also be found here. There are stairs leading to the restaurant; bar and lounge area. There is also a deck under a shaded roof where guests can relax and unwind. The bar is well stocked with spirits; local beer and wine and there is a nice fireplace. The lounge area has comfy sofas and arm chairs where guests can meet up and chat. Meals are served either buffet style; from a set menu or ‘plate serve’ depending on the number of guests. The inn offers 24 luxury rooms which have spacious en-suite bathrooms; fridge; fan; mosquito nets; tea/coffee station an in-room safe.